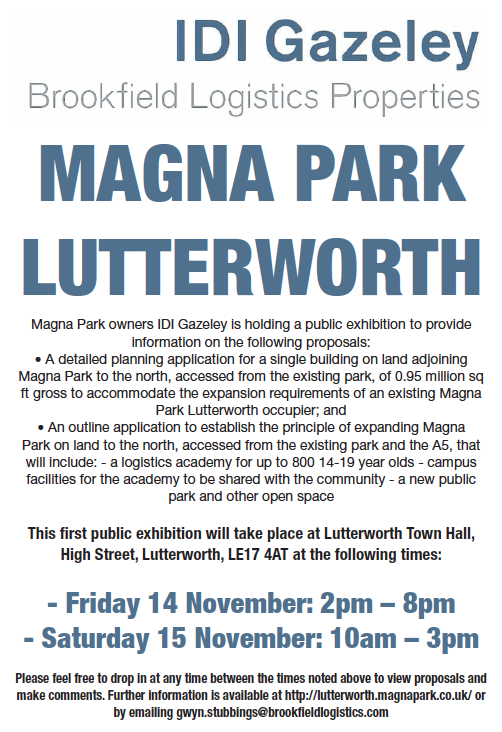 The local community is invited to a public exhibition for plans to expand Magna Park, Lutterworth and build a new Logistics Academy. Magna Park owners Gazeley have announced ambitious plans that stand to create up to 6,000 new jobs as the distribution centre expands on some 200 hectares of land to the north of the existing park. The scheme could take the total number of jobs at Magna Park to over 15,000. The public exhibition is aimed at giving people the chance both to comment on the emerging plans for a one million sq ft distribution centre for an existing occupier of Magna Park who wishes to expand and also to feed into the developing proposals for the wider expansion of the park. The developing proposals for the wider expansion of the park include a university-partnered and campus-based Logistics Academy for up to 800 14-19 year olds together with a new community park centred on the scheduled ancient monument. This will be the first of a series of exhibitions that will give residents the chance to find out more, feed into and help to shape the proposals as they are developed. Gwyn Stubbings, Gazeley’s Planning Manager said he hoped as many local people as possible would come to the exhibition to see and provide feedback on the emerging plans for themselves and take advantage of the opportunity to put any questions they have to the team that is working up the proposals. Mr Stubbings said: “It is really important for us to be good neighbours and to be involved with the local community, which is why I hope as many people as possible will come to the exhibition to meet us and find out more. We are committed to listening to our neighbours and enforce strict controls on our occupiers to minimise disturbance to people living nearby.